Annual Vassana (Spiritual Rains) Retreat 2018 for Three Months of Letchworth Dhamma Nikethanaya Community commenced on 29th July until 04th November. Kathina Ceremony will be held on Sunday 04th November. All are Kindly invited to attend Meditation, Blessings Chanting, Daily Poojas & Dana activities during this Highest Blessed Season! You can Sponsor a week of this season and be part of this highest meritorious field. Please don’t feel obliged but feel free. We encourage everyone to support us only within their means and practice by using all available resources to gain the happiness and peace freely without no obligation but boundless compassion. If you wish to sponsor a week please see the availability and suitability from the list dates below. Thank you. May you be well and happy! The Annual Vassana (Rainy) Retreat is regarded as the most important period and the highest auspicious season (punnya kalaya) of The Buddhist Community. Historically, the beginning of this typical ceremony coincides with the Easala Full Moon Day in the month of July. The Noble Three Jewels (Buddha, Dhamma & Sangha) reached a completion on Esala (July) Full Moon Day as the Lord Buddha delivered The First Discourse “Dhammacakkapavattana Sutta”, setting the wheel of Dhamma in motion and ordaining five ascetics as the first disciples. Followed by this historical incident, The Blessed One (Buddha) instructed Bhikkhus (Sangha Community) to observe a retreat for three months during the rainy season (vassana). Abiding to this custom, Buddhist Community across the globe maintained this observance of retreat annually over 2606 years to-date. Spiritual Rains Season is the highest blessed season of the Buddhist Tradition. This year it commences from 29th July till 04th November 2018. During this holly season we do lots of spiritual activities. You are very much welcome to attend Meditation, offerings, Morality practices, chanting & meditation session. As they are being done according to a very set time table, please check the time and date of different activities in advance. If you wish us to have a smooth running of this season, you can support us by sponsoring a week of the season. There are fifteen weeks. In average the daily cost of living of the centre to facilitate this spiritual retreat is £59/= per day. Under these circumstances, our temple committee has decided to introduced to allocate £70 per week as a fair factional donation to sponsor a week. Those who sponsor weekly, we will remember them daily at three times on morning pooja, Mid day dana pooja and evening pooja and meditation during the whole week. This is similar to offering a dwelling (temple) to monks. Further those who could not sponsor weekly basis, they are being kindly requested to contribute minimum suggested (not compulsory) donation of £10/= towards temple maintenance fund, alongside of their religious activities (e.g. dana, bodhi pooja, blessings etc) takes place at the centre. May the triple gem and all the celestial beings bless you all! May these merits bring you good health, prosperity, happiness and Peace! May you attain lasting happiness Nibbana! If you wish to sponsor a week of the three months retreat season, please put your name down: Only 16 weeks are available. 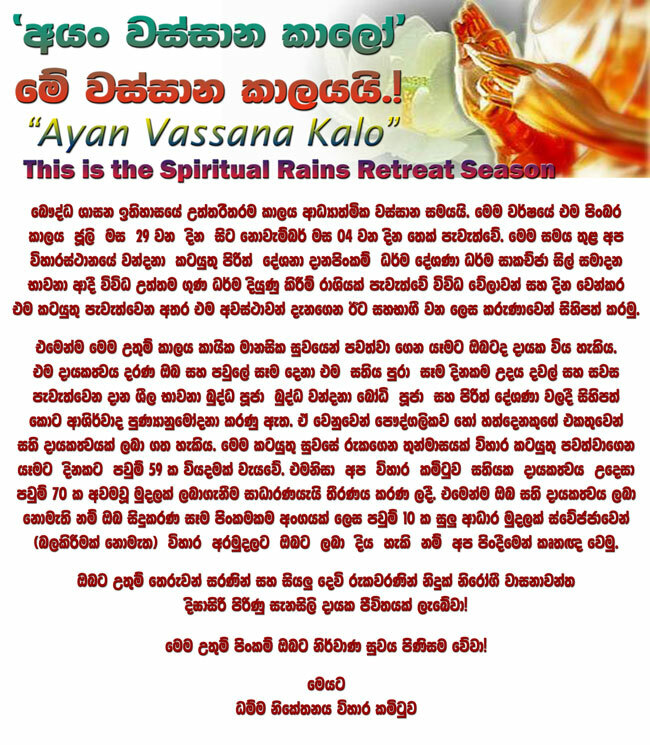 This year Vassana (Rainy) Retreat Season falls from 29th July till 04th November. Annual Kathina Ceremony will be held on Sunday 04th November 2018. Centre will conduct blessings chanting bodhi pooja, sutta dhamma discussion, weekly talks, monthly full moon day observances, Full Day Silent Retreat Meditation Sessions & daily poojas. If you wish to be part of the activities during the retreat season, please contact the centre. For up-to-date programmes please see our website, www.buddhistacademy.com or please join our email database on dhammanikethanaya@gmail.com or buddhistacademy@gmail.com. We wish Buddhist Community a very happy, peaceful and successful Vassana Retreat 2018 with all the good health & protection. May the Light of the Noble Triple Gem continue to shine in your hearts! With blessings of the merits accrued from this highest Blessed Season, May you all progress in prosperity, leading an eventful spiritual life!